Wednesday August 21st 1878 We girls dressed as soon as we had eaten our breakfast and went to the club rooms to wait on the table. Hatt stayed till after one oclock and I till after two. Then I went down to the Park to see who was there. When I came home I found a basket of fine peaches here that Charlie had sent. I put them up. Hatt and Ott sung in the temperance concert at four oclock. We all stayed at home in the evening. I wrote to Charlie. I was very tired tonight. 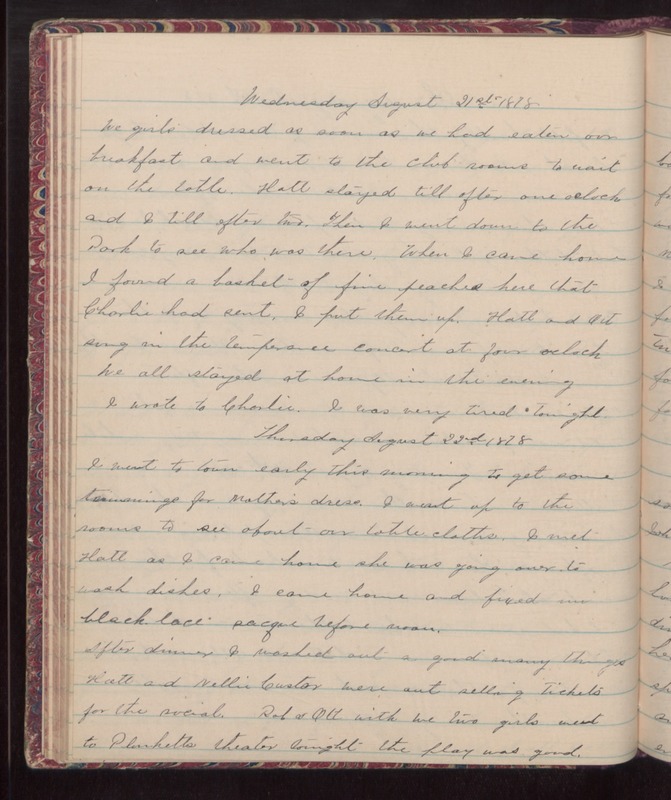 Thursday August 22nd 1878 I went to town early this morning to get some trimmings for Mother's dress. I went up to the rooms to see about our tablecloths. I met Hatt as I came home she was going over to wash dishes. I came home and fixed [illegible] black lace sacque before noon. After dinner I washed a good many things. Hatt and Nellie Custor were out selling tickets for the social. Rob & Ott with we two girls went to Plunketts theater tonight the play was good.